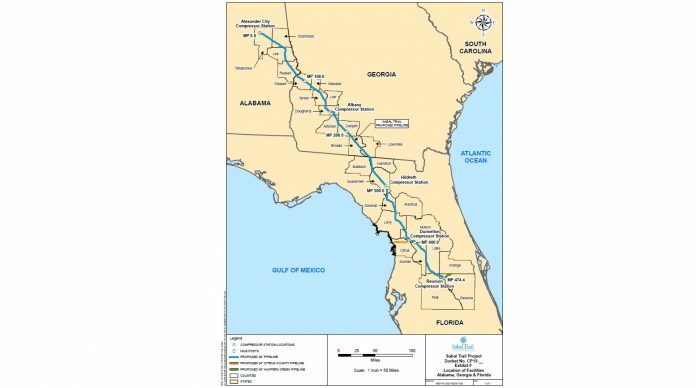 Sabal Trail Transmission LLC has received FERC approval to commence construction of certain Phase 1 facilities associated with its Sabal Trail Project. Sabal Trail Transmission, a joint venture of Spectra Energy Corp., NextEra Energy Inc., and Duke Energy is proposing to design, construct, and operate a 515-mile (828-km) natural gas pipeline and associated facilities to provide transportation services for power generation needs to Florida Power and Light and Duke Energy of Florida beginning in May 2017. The approved facilities include three compressor stations, six meter and regulating stations, and other appurtenant facilities. Alexander City Compressor Station – Construction of a new compressor station near Alexander City, Alabama, USA, with a total 71,000 hp (52,966 kW) of compression. Hildreth Compressor Station – Construction of a new compressor station near Lake City, Florida, USA, with a total 20,500 hp (15,293 kW) of compression. Reunion Compressor Station – Construction of a new compressor station in Osceola County, Florida, with a total 36,400 hp (27,154 kW)) of compression. Previous articleThe August Issue Of Gas Compression Magazine Is Here!